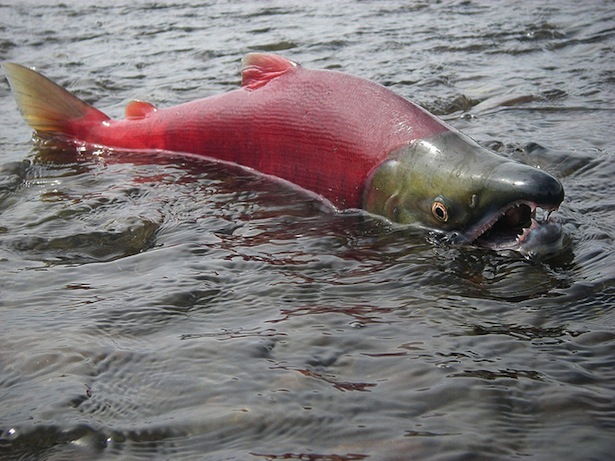 NOAA Fisheries Service says that a new biological opinion issued Jan. 17 confirms that its plan for improving salmon and steelhead survival through the Federal Columbia River Power System on the Columbia and Snake rivers is working, and efforts to rehabilitate habitat for the fish will indeed help dodge extinction for species listed under the Endangered Species Act. NOAA Fisheries in a press notice release says that planned actions at the dams and elsewhere are benefiting federally protected salmon and steelhead as much as or more than anticipated five years ago. The new findings report says that the ongoing strategies outlined in the 2008/2010 BiOps have been effective. The new supplemental BiOp analyzed research and monitoring results from the first five years of work under the original biological opinions. "This supplemental biological opinion confirms we are on the right track when it comes to ensuring the survival of salmon and steelhead species in the Columbia River system now and well into the future," said Will Stelle, West Coast regional administrator for NOAA Fisheries. "Lots of hard work and collaboration across the region made this progress possible." Biological opinions determine if a federal action such as the operation of the FCRPS is likely to jeopardize the continued existence of a species listed under the ESA. If an action is found to jeopardize a species, a "reasonable and prudent alternative" is developed detailing actions to avoid the likelihood of jeopardizing the continued existence of listed species or resulting in the destruction or adverse modification of critical habitat. The 2014 Supplemental FCRPS Biological Opinion concludes that the RPA, as amended, is sufficient and is not likely to jeopardize the continued existence of the listed species or destroy or adversely modify their critical habitat. Additional mitigation actions are therefore not necessary to satisfy the requirements of ESA, says the new BiOP. NOAA Fisheries issued a biological opinion for the FCRPS in 2008 with a RPA outlining more than 70 actions necessary to protect 13 ESA-listed salmon and steelhead species through 2018. In 2010 NOAA Fisheries reexamined and reaffirmed the 2008 biological opinion. The supplemental "BiOp" rby NOAA Fisheries comes in response to a federal court that has in the past found salmon recovery plans wanting. Judge James A. Redden ruled in May 2011 that NOAA Fisheries 2008/2010 FCRPS BiOp, which was to prevail for 10 years, was illegal and ordered that its flaws be corrected by Jan. 1, 2014. BiOps are required under the ESA to evaluate whether federal actions, such as the operation of the dams, jeopardize listed stocks. A total of 13 salmon and steelhead stocks that spawn in the Columbia-Snake river basin have been listed since 1991. "I struck the 2000 BiOp, and the 2004 BiOp, and the 2008/2011 BiOp," Redden, who was assigned the case in February 2003, said in November 2011 in announcing that he was resigning as magistrate in the FCRPS legislation. In May 2003 Judge Redden granted motions for summary judgment invalidating a 2000 NOAA FCRPS strategy, which was replaced by a 2004 BiOp. On May 2005 Redden declared the 2004 BiOp arbitrary and capricious. It was eventually replaced by the 2008 BiOp, which was supplemented in 2010. In an Aug. 2, 2011, opinion and order regarding the validity of the agency's 2008/2010 BiOp, Redden said that "Federal Defendants have failed, however, to identify specific mitigation plans to be implemented beyond 2013. Because the 2008/2010 BiOp's no jeopardy conclusion is based on unidentified habitat mitigation measures, NOAA Fisheries' opinion that the FCRPS operations after 2013 will not jeopardize listed species is arbitrary and capricious." The judge ordered a court-monitored remand with Jan. 1, 2014, due date (which was later extended) for production of "a new biological opinion that reevaluates the efficacy of the RPAs in avoiding jeopardy, identifies reasonably specific mitigation plans for the life of the biological opinion, and considers whether more aggressive action, such as dam removal and/or additional flow augmentation and reservoir modifications are necessary to avoid jeopardy." Redden said in that 2011 opinion that not only was post-2013 mitigation largely unidentified, but the benefits from current and future actions are also unknown. The long-running lawsuit has pitted a coalition of fishing and conservation groups led by the National Wildlife Federation and, more recently, the state of Oregon, against the federal government but has also involved tribes, utility interests, irrigators, navigators and others with a vested interest in the fish and/or other river resources. The three FCRPS "action agencies" are the Army Corps of Engineers and the Bureau of Reclamation, which operate the dams, and the Bonneville Power Administration, which markets power generated in the system. The FCRPS BiOp guides the agencies in operating the FCRPS and requires a series of mitigation measures, called reasonable and prudent alternatives that are intended to avoid jeopardy to the listed species that migrate through the hydro system. NOAA Fisheries said the supplemental biological opinion addresses the remand order. "Based on a thorough review of the best available scientific data and information, with additional project definition, analysis, and amended RPA actions NOAA Fisheries has recommended to the FCRPS Action Agencies, NOAA Fisheries concludes that the 2008 FCRPS Biological Opinion's analysis and conclusions, as supplemented in 2010, remain valid. The 2014 Supplemental FCRPS Biological Opinion concludes that the RPA, as amended, is sufficient and is not likely to jeopardize the continued existence of the listed species or destroy or adversely modify their critical habitat." Addresses the court's remand order by identifying specific tributary and habitat actions through 2018. Verifies that effects of the RPA actions will be as or, for some populations, more beneficial than anticipated in the 2008 FCRPS Biological Opinion. Determines the best science available was used by the action agencies (The Army Corps of Engineers, Bonneville Power Administration and the Bureau of Reclamation) for determining the efficacy of their habitat actions. The Corps and Bureau operate hydro projects in the Snake and Columbia river basins; BPA markets power generated at the dams. Finds the adaptive management components of the RPA have performed as expected, facilitating more efficient and effective implementation. Concludes that the 2008 FCRPS biological Opinion analysis and conclusions, as supplemented in 2010, remain valid; and that the RPA, as amended, is not likely to jeopardize the continued existence of the listed species and destroy or adversely modify designated critical habitat.